f you can't take the heat, get out of the kitchen. If you want to reach millennials on mobile devices, however, get back in there. 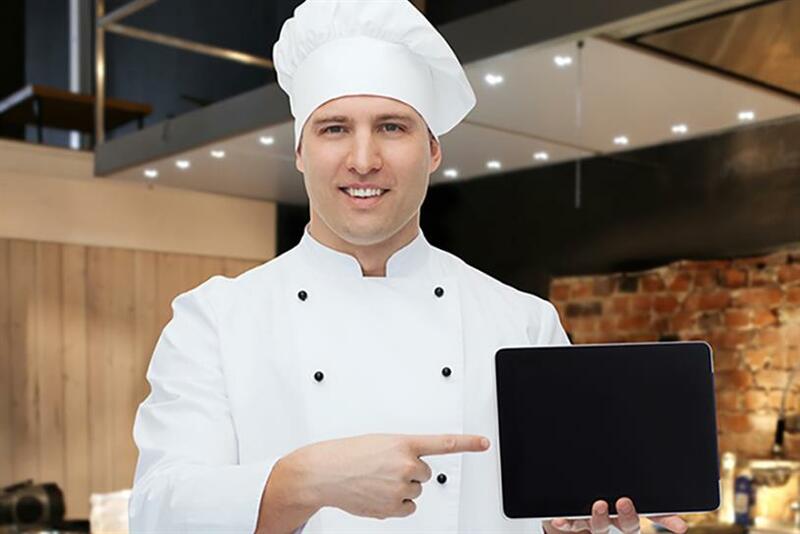 A new study from Think With Google — with research from mcgarrybowen and Kraft Foods — shows that 59% of 25- to 34-year-olds enter the kitchen with either a smartphone or tablet handy. And, according to the study, the demographic is hitting the kitchen at rapid rates. Here, the three phases of Millennials' consumer journey in the kitchen and how to best reach them in each. In some cases, millennials turn to mobile while in the kitchen to peruse recipes. In fact, 31% of millennials say that the decision of what to cook is the least enjoyable part of the cooking process. And one quarter of respondents say that the most important part is adding a personal touch to a recipe, while 41% say they're interested in food hacks. Search interest for "best recipes" on YouTube is up 48% year over year. YouTube sensation CrazyRussianHacker has used this to his advantage, as his "Food Life Hacks" playlist has more than 555,000 views (at the time of writing). For brands: Tap into millennials' curiosity—and recipe search—with specific culinary ideas. Offer a salmon recipe in response to a "healthy recipes" search. Turn the cooking experience into a fun journey. And don't worry if the recipe is too complex; apparently, it's all about the journey with millennials—92% say they were satisfied even if there were mistakes in the dish. Once the dish is chosen, the how-do-I-make-it moment of fear kicks in, and Millennials are notorious for heading to Google or YouTube to combat it. How-to food-related content on YouTube is on the rise, with more than 419 million views in 2014 alone. 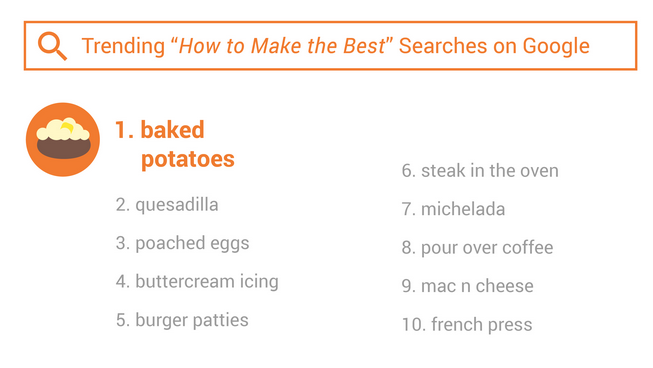 As a matter of fact, "How to Cook That" is one of the 10 most popular how-to searches on YouTube. Most of these wannabe Emerils are amateurs in the kitchen, so usually they're only looking for basic advice. However, when they do go above and beyond it's usually in search of a unique ingredient or new flavor, which all comes full circle—40% of Millennials say they chose a brand featured in a recipe because it adds a unique flavor. For brands: Be there for the discovery and consideration stages. It's not just about your product, but rather what Millennials can do with that ingredient or tool; help them develop the techniques required to make interesting meals with your product. This is where the am-I-making-this-right moments occur, and Millennials will seek guidance. Questions such as "What temperature should I bake chicken at" are searched on mobile devices, and 68% of millennial mothers say they also watch videos while cooking. And with hands often occupied while the need to search strikes, voice search becomes the norm; 23% of adults use it while cooking. As the oven preheats, bakers sometimes realize they're out of an ingredient — a potential I-want-to-buy moment for brands. Indeed, 39% of consumers say they've made a purchase of some kind from their kitchens. Millennials aren't always alone in the kitchen; 27% say they're likely to share the experience with a spouse, friend, or child. Such bonding activities help millennials view cooking as an opportunity to spend quality time with loved ones, as opposed to a chore. "For Kraft, we believe it's about not only asking what we can do to help consumers create a better dish—but what we can do to help consumers achieve a better experience across the board," says mcgarrybowen's Conroy. For brands: The cooking experience doesn't end once the ingredients have been bought and the food is in the oven. Think beyond recipes and how-tos, and implement ways to promote a fun and social cooking experience for millennials.